Dr Jane Goodall – is everything her surname says – ‘Good – all of her.’ An absolute gem of a woman who’s earned the trust and respect of both chimps and humans across the globe. In fact, she’s the only human to have ever been accepted as part of a chimp community – undoubtedly because she instinctively noticed the emotional responses, gestures and social interactions to communicate and build relationships with them. Like all good women, she gave them names too! Practices she later learned contradicted the observation rules of how an Ethologist should work. Doing things differently – which included field work before formal studies – allowed Jane to substantiate her belief that the similarity between chimps and humans went way beyond our genes. I had the pleasure of hearing Jane’s tales in Auckland at an event she held earlier this month. It was like sitting in a very large lounge with your grandma, listening to her share meaningful moments of her 83 year lifespan. Her stories were peppered with humour and threaded with nuggets of wisdom learned from watching the chimps. The funniest of which was when she pointed out the similarity between politicians and aggressive male chimps! The most endearing behaviour being the patient, fun and playful way female chimps tended to their young; traits she made a conscious decision to adopt when bringing up her own son, Hugo. She spoke with deep affection and admiration for her own mothers patience and the incredible way she not only encouraged her to explore her curiosity, but managed the repercussions of her adventurous mind; citing the time she graciously suggested the pile of worms in Janes bed would be far happier in their own environment! The distinguishing characteristics she sees in chimps and the people who’ve influenced her life have clearly rubbed off on her. She integrated her caring nature with her scientific background, becoming an activist for conservation and animal and human welfare 31 years ago – for which she was awarded the Order of British Empire in 2004 when she became Dame Jane. Today she travels the world 300 days a year inspiring change through conversation – doing what she loves and naturally fulfilling her role as the UN Messenger for Peace. She’s a walking, talking testament to prove you can achieve anything you set your heart on. It’s 60 years since she first went to Africa and became involved with primates. The vision she had then has come to fruition in the form of the Jane Goodall Institute and the Roots and Shoots programme. Fortunately she loves writing so she can continue to share her extraordinary insights when the travelling becomes too much. The evening closed with a video of Janes most precious story about a chimp called Wounda – a tear jerking ending to a humbling evening. – watch it here – https://www.youtube.com/watch?v=YzC7MfCtkzo Today Wounda is the only chimp on the island with a youngster because she somehow managed to slip through the contraceptive programme. Like Jane, Wounda was destined to be different. Thankyou for sharing your experience Philippa. 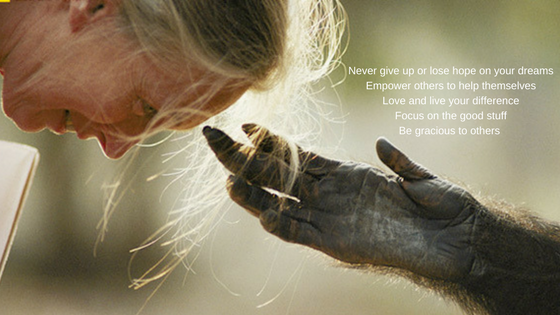 I am inspired to look up Jane Goodall’s work. Sounds like we can all learn a lot from this wonderful lady.